Tom Kita Chara Lodge 96, Order of the Arrow, welcomes you to TKC's online council ring. 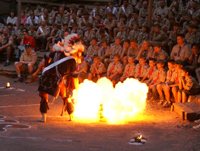 Founded in 1936, Tom Kita Chara Lodge is affiliated with Samoset Council and serves over 600 arrowmen in north-central Wisconsin. A convenient way for you to pay for all your event fees and dues for the year at one time.